I'm a bit of an early adopter when it comes to techstuff. Not everything I try is useful or even enjoyable but there are a few apps that now serve me well and I now regard as indispensable. Here's my top 5 list of apps that help me run two gardening businesses. Evernote is proving to be invaluable. It was a bit of a slow burner to start with but I now use it with impunity. From the website - Evernote makes it easy to remember things big and small from your everyday life using your computer, phone, tablet and the web. How I use it - Taking notes and photos whilst on site using my phone. These could be for new job quotations, for plant identification etc. Whilst on the go I can draft to do lists or material schedules. Everything syncs with the office PC and tablet at home so wherever you may be you can access and edit your notes. To tie in with our social media obligations I use it extensively to save links to articles I've enjoyed. These then get posted or written about when I have a bit more time. It serves as a great digital repository for all my reading & writing. From the website - Google Drive is everywhere you are—on the web, in your home, at the office and on the go. So wherever you are, your stuff is just...there. How I use it - Primarily I use it the same way I use Evernote by taking notes or drafting letters and emails when I'm out and about. I haven't made the leap of using it exclusively for compiling our letters and spreadsheets as we still use Word, Excel etc but who knows, maybe some day. The most important use I have for it though is to compile garden worksheets listing all the items that need to be addressed in a particular garden. Google Drive then allows you to share a link to that worksheet with your client so they can also have a record of what was agreed. This worksheet is also then printed off for the maintenance team to take with them on the day they are doing that particular job. Basically, everybody then knows what needs to be done. Dropbox is another cloud application that we use extensively. From the website - Dropbox is a free service that lets you bring your photos, docs, and videos anywhere and share them easily. Never email yourself a file again! How we use it - Our business has grown steadily over the last 7 years and with that comes logistical IT issues. We use Dropbox to share file structures in the cloud that can then be accessed from any computer. Not all files are kept in the cloud but those which we use regularily are and it saves us a lot of time and hassle by keeping them there. Folders can be shared with clients or staff and it can be a useful way of letting people access large or numerous files securely and without tripping up an email system. Our staff also upload garden before and after photos to a shared folder in order that we can then access them for putting on our website or social media pages. 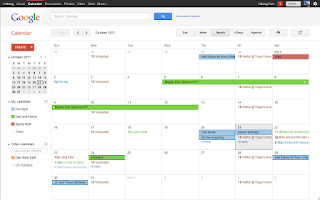 How we use it - It's vital that we can synchronise the Vialii scheduling and Google's calendar allows us to do this. I can now access the same information when I'm out and about that Jill can access back in the office. No more calls or text to check availability. 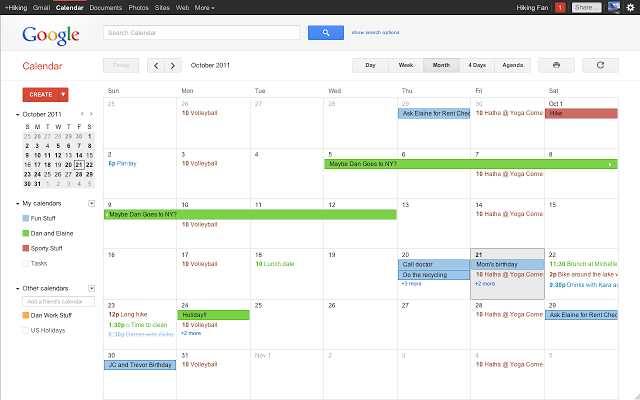 We still use Outlook at home the Google calender sync app keeps everything together. Another useful feature is the ability to add sub-calendars so I can plot project specific programming onto it's own calendar and still have access to the information. From the website - Google Reader, where keeping up with your favorite websites is as easy as checking your email. How I use it - I subscribe to a lot of gardening blogs and Google reader curates all my reading in one place and allows me to catch up on the latest gardening news and opinion when I'm out and about. It has great share features which allow me to share links with Evernote & Drive for future reference and use. So that's my top 5 Apps for running a gardening business. Whilst I appreciate that they are not gardening specific I hope I have highlighted the specific ways I use them to suit my business needs. Blogger - The Android app is useful for drafting blog posts. Functionality is not great so I only use it for drafts and then carry out the finishing touches back at the office. Camscanner - A great app for scanning in documents to your phone using your camera. Photos are converted into PDF files and can then be shared to the cloud. Google+ - Not an app as such but Google+ is quickly becoming an increasingly important place to be, particularly with your business. Posts on Google+ can increase your ranking in Google search as can blog posts that you have compiled. I don't know the technical ins and outs but I take it as read that a business needs to have a presence there. I'm always on the look out for new indispensable apps or productivity tools so if you know of anything I'm missing I'd love to hear from you.